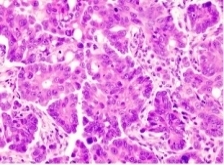 Epithelial carcinoma is one of the three main classes of the ovarian tumor. Reported most often in women who have reached adulthood, this form of cancer is formed from cells that are located along the surface of the ovary. Epithelial ovarian tumors are easily the most common form of cancer that is found in the ovaries, accounting for just under 60% of all diagnosed tumors and over 80% of malignant tumors associated with the ovaries. This is the most common type of ovarian cancer. In fact, when most people think in terms of ovarian cancer, this is the form they are referring to. In size, a serous tumor may be almost impossible to spot or grow to a point that the tumor fills most of the abdominal cavity. Serous tumors are likely to be benign or borderline prior to the age of fifty. However, the chances of this type of epithelial carcinoma developing into a malignancy increase significantly among older females. If there is a history of ovarian cancer in the family line, the risks are also increased at any age. Even among females who develop a serous tumor, the five-year survival rate is very high. If the tumor is diagnosed as benign or borderline, there is a 70-100% chance of full recovery. Depending on the severity of the malignancy, the chances of surviving for five years after the diagnosis range anywhere between 25-90%. As with any form of cancer, early detectionincreases the chances of survival. 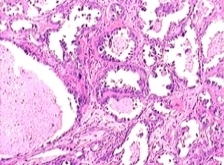 These tumors are another type of epithelial cancer. Less common than serous tumors, the mucinous variety still account for roughly 25% of the ovarian cancers that are identified and treated. Developing a mucinous tumor early in life is extremely rare. Most cases involve women who are in between puberty and menopause. Even though the majority of mucinous tumors are benign, around 15% of reported cases involve a malignancy. When it comes to survival rates, women diagnosed with mucinous tumors that are benign or borderline have up to a 95% chance of living for at least ten years after diagnosis. If there is a malignancy present, there is still a chance that two out of every three women with a mucinous tumor will live another ten years. Endometrioid tumors tend to be malignant in most cases. 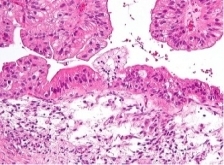 Accounting for roughly 20% of all cases of ovarian cancer, this form of ovarian epithelial carcinoma tends to develop into a shape that is somewhat similar to endometrial glands. As the tumor grows, it will develop a series of branches that can invade surrounding tissue and organs, allowing the tumor to feed with greater ease and become more solid. 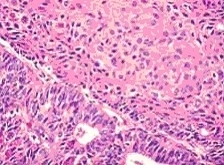 Survival after the appearance of an endometrioid tumor depends a great deal on how early the tumor is identified and treated. Because of the high possibility of malignancy, aggressive forms of treatment such as chemotherapy and possibly surgery should commence as soon as possible. If the tumor is caught in time and successfully treated, patients have a five-year survival rate of 75%. 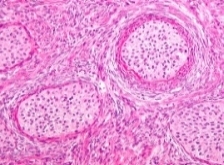 Clear cell tumors are a type of epithelial carcinoma that can sometimes develop in conjunction with endometrioid tumors. Containing plenty of clear cytoplasm, clear cell tumors are extremely dangerous. Early detection and treatment increase the chances of survival after five years to 65%. However, if the tumor is not identified in its early stages, the chances of recovery are extremely low. The Brenner tumor, also known as the transitional cell tumor, can be either extremely small or grow significantly. Tumors of this type may be solid masses or contain a fair amount of fluid. When the tumor has begun to invade surrounding tissue, there is a good chance that the growth is malignant. All types of epithelial cancer are treatable in the early stages. Depending on the circumstances, chemotherapy may be tried as a first round of treatment, followed by surgery.